InfoSAWIT, TAIPEI –After succeeding the trade mission in New Zealand, Ministry of Trade continued the same to Taiwan. It is led by General Director of National Export Development, Arlinda and takes 79 businessmen and stakeholders from Indonesia. 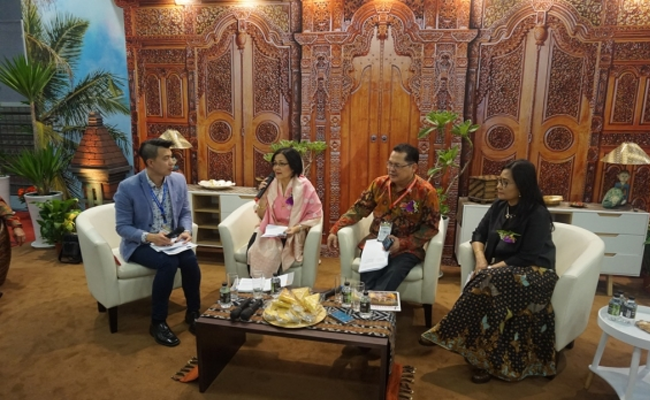 The trade mission itself would be running from 22 – 25 March 2018 in the series of Indonesian Week 2018 exhibition. The businessmen and stakeholders joining the event are from many promising sectors, such as, fashion and accessory, footwear, food and drink, paper, property, textile, coffee, tea, and palm oil products, biodiesel, travel agent, and skillful workers. “Ministry of Trade keeps trying its best to the trade mission in many regions to boost the exports and get the target of exports, 11%,” she said in the official statement to InfoSAWIT, Thursday (22/3/2018). Ministry of Trade is in synergy with Kantor Dagang dan Ekonomi Indonesia (KDEI) in Taipei to makeIndonesian Week 2018 in Taiwan World Trade Center, the biggest trade center in Taiwan. “The event is about to inform and facilitate the stakeholders and businessmen from both countries to get their business partners. It is also the commitment of the government to increase the trade, cooperation, and make profitable business climate for both sides,” she said. Head of KDEI, Robert James Bintaryo did hope, through the event, the people of Taiwan could know more about Indonesia and they are interest in visiting Indonesia, could also do business with the businessmen from Indonesia. In the business forum, the businessmen would get information about the policies, the business chances, investment, and opportunity for both sides. “In the event, Ministry of Trade would promote some premium export commodities, such as, coffee, crude palm oil, and services,” she said. Indonesia is as the fourth biggest coffee producer, and the seventh biggest coffee exporter in the world. The most qualified coffee from Indonesia that the world knows as “Premium Coffee” is Javanese, Mandailing, Gayo, and Toraja Coffee. The exports from Indonesia to many countries in 2017 increased 17,71% compared to the previous year. The coffee exports from Indonesia to Taiwan in 2017 reached about US$ 18,49 million and it is potential to increase. The other exports that significantly contribute to the exchange was crude palm oil. Indonesia is the biggest crude palm oil (CPO) producer in the world within the export reaching US$ 20,7billion in 2017 and the markets reaching 47,93% of the total palm oil markets in the world. She also noted, CPO plays the important role to conquer the poverty in Indonesia. It is also the source of living for 5,3 million direct workers, and increases the standard of life for 21 million smallholders. Palm oil exports from Indonesia to Taiwan in 2017 reached US$ 2,09million or increased about 27,39% compared to the previous year that reached US$ 1,64 million. The palm oil import in Taiwan from many countries reached US$ 176,17million within the markets in Taiwan reaching 4,66%. Indonesia is committed to improve the way of production so that it is more sustainable in economy, social, and environment. Based onRoundtable Sustainable Palm Oil (RSPO) scheme, Indonesia is the biggest Certified Sustainable Palm Oil (CSPO) producer. “Indonesia is ready to fulfill the sustainable palm oil demand 100% in high quality. Indonesia now supplies 6,58million tons or more than a half of CSPO markets globally,” she said.